11 A None No Power Seat 11 A is a standard Business Class bulkhead seat whose proximity to the lavatory may be bothersome. This seat is missing a window. 11 D None No Power Seat 11 D is a standard Business Class bulkhead seat whose proximity to the lavatory may be bothersome. 11 F None No Power Seat 11 F is a standard Business Class bulkhead seat whose proximity to the lavatory may be bothersome. 11 K None No Power Seat 11 K is a standard Business Class bulkhead seat whose proximity to the lavatory may be bothersome. This seat is missing a window. 15 F None No Power Seat 15 F is a standard Business Class seat whose proximity to the lavatory may be bothersome. 15 K None No Power Seat 15 K is a standard Business Class seat whose proximity to the lavatory may be bothersome. 16 D None No Power Seat 16 D is a standard Business Class seat whose proximity to the lavatory and galleys may be bothersome. 16 F None No Power Seat 16 F is a standard Business Class seat whose proximity to the lavatory and galleys may be bothersome. 17 A None No Power Seat 17 A is a standard Business Class seat whose proximity to the galleys may be bothersome. 17 K None No Power Seat 17 K is a standard Business Class seat whose proximity to the galleys may be bothersome. 18 D None No Power Seat 18 D is a standard Business Class seat whose proximity to the galleys may be bothersome. 18 F None No Power Seat 18 F is a standard Business Class seat whose proximity to the galleys may be bothersome. 2 C None No Power Seat 2 C is a standard First Class Suite. 2 D None No Power Seat 2 D is a standard First Class Suite. 24 A None No Power Seat 24 A is a standard Business Class seat. 24 F None No Power Seat 24 F is a standard Business Class seat. 24 K None No Power Seat 24 K is a standard Business Class seat. 25 F None No Power Seat 25 F is a standard Business Class seat. 26 F None No Power Seat 26 F is a standard Business Class seat. 27 A None No Power Seat 27 A is a standard Business Class seat whose proximity to the lavatories may be bothersome. 27 D None No Power Seat 27 D is a standard Business Class seat whose proximity to the lavatories may be bothersome. 27 F None No Power Seat 27 F is a standard Business Class seat whose proximity to the lavatories may be bothersome. 27 K None No Power Seat 27 K is a standard Business Class seat whose proximity to the lavatories may be bothersome. 3 C None No Power Seat 3 C is a standard First Class Suite whose proximity to the lavatories and galleys may be bothersome. 3 D None No Power Seat 3 D is a standard First Class Suite whose proximity to the lavatories and galleys may be bothersome. 31 A None No Power Seat 31 A is a standard Premium Economy seat that may have slightly restricted legroom due to the position of the bulkhead. The proximity to the lavatories and galleys may be bothersome. There is no floor storage for this seat during takeoff and landing. 31 C None No Power Seat 31 C is a standard Premium Economy seat that may have slightly restricted legroom due to the position of the bulkhead. The proximity to the lavatories and galleys may be bothersome. There is no floor storage for this seat during takeoff and landing. 31 D None No Power Seat 31 D is a standard Premium Economy seat that may have slightly restricted legroom due to the position of the bulkhead. The proximity to the lavatories and galleys may be bothersome. There is no floor storage for this seat during takeoff and landing. 31 E None No Power Seat 31 E is a standard Premium Economy seat that may have slightly restricted legroom due to the position of the bulkhead. The proximity to the lavatories and galleys may be bothersome. There is no floor storage for this seat during takeoff and landing. 31 F None No Power Seat 31 F is a standard Premium Economy seat that may have slightly restricted legroom due to the position of the bulkhead. The proximity to the lavatories and galleys may be bothersome. There is no floor storage for this seat during takeoff and landing. 31 G None No Power Seat 31 G is a standard Premium Economy seat that may have slightly restricted legroom due to the position of the bulkhead. The proximity to the lavatories and galleys may be bothersome. There is no floor storage for this seat during takeoff and landing. 31 H None No Power Seat 31 H is a standard Premium Economy seat that may have slightly restricted legroom due to the position of the bulkhead. The proximity to the lavatories and galleys may be bothersome. There is no floor storage for this seat during takeoff and landing. 31 K None No Power Seat 31 K is a standard Premium Economy seat that may have slightly restricted legroom due to the position of the bulkhead. The proximity to the lavatories and galleys may be bothersome. There is no floor storage for this seat during takeoff and landing. 35 K None No Power Seat 35 K is a standard Premium Economy Class seat. 4 A None No Power Seat 4 A is a standard First Class Suite whose proximity to the lavatories and galleys may be bothersome. 4 F None No Power Seat 4 F is a standard First Class Suite whose proximity to the lavatories and galleys may be bothersome. 41 A None No Power Seat 41 A is a standard Economy seat that Singapore Air designates as a "Forward Zone Seat". Forward Zone Seats enable you to be among the first in Economy Class to disembark the plane. You may select these seats in advance for free when you book a Flexi fare type. When you book a Lite or Standard fare type, there is an additional fee for this seat. This seat may have restricted legroom due to the position of the bulkhead. The tray table is in the armrest, making the armrest immovable, and slightly reducing seat width. There is no floor storage for this seat during takeoff and landing. 41 B None No Power Seat 41 B is a standard Economy seat that Singapore Air designates as a "Forward Zone Seat". Forward Zone Seats enable you to be among the first in Economy Class to disembark the plane. You may select these seats in advance for free when you book a Flexi fare type. When you book a Lite or Standard fare type, there is an additional fee for this seat. This seat may have restricted legroom due to the position of the bulkhead. The tray table is in the armrest, making the armrest immovable, and slightly reducing seat width. There is no floor storage for this seat during takeoff and landing. 41 C None No Power Seat 41 C is a standard Economy seat that Singapore Air designates as a "Forward Zone Seat". Forward Zone Seats enable you to be among the first in Economy Class to disembark the plane. You may select these seats in advance for free when you book a Flexi fare type. When you book a Lite or Standard fare type, there is an additional fee for this seat. This seat may have restricted legroom due to the position of the bulkhead. The tray table is in the armrest, making the armrest immovable, and slightly reducing seat width. There is no floor storage for this seat during takeoff and landing. 41 D None No Power Seat 41 D is a standard Economy seat that Singapore Air designates as a "Forward Zone Seat". Forward Zone Seats enable you to be among the first in Economy Class to disembark the plane. You may select these seats in advance for free when you book a Flexi fare type. When you book a Lite or Standard fare type, there is an additional fee for this seat. This seat may have restricted legroom due to the position of the bulkhead. The tray table is in the armrest, making the armrest immovable, and slightly reducing seat width. There is no floor storage for this seat during takeoff and landing. 41 E None No Power Seat 41 E is a standard Economy seat that Singapore Air designates as a "Forward Zone Seat". Forward Zone Seats enable you to be among the first in Economy Class to disembark the plane. You may select these seats in advance for free when you book a Flexi fare type. When you book a Lite or Standard fare type, there is an additional fee for this seat. This seat may have restricted legroom due to the position of the bulkhead. The tray table is in the armrest, making the armrest immovable, and slightly reducing seat width. There is no floor storage for this seat during takeoff and landing. 41 F None No Power Seat 41 F is a standard Economy seat that Singapore Air designates as a "Forward Zone Seat". Forward Zone Seats enable you to be among the first in Economy Class to disembark the plane. You may select these seats in advance for free when you book a Flexi fare type. When you book a Lite or Standard fare type, there is an additional fee for this seat. This seat may have restricted legroom due to the position of the bulkhead. The tray table is in the armrest, making the armrest immovable, and slightly reducing seat width. There is no floor storage for this seat during takeoff and landing. 41 G None No Power Seat 41 G is a standard Economy seat that Singapore Air designates as a "Forward Zone Seat". Forward Zone Seats enable you to be among the first in Economy Class to disembark the plane. You may select these seats in advance for free when you book a Flexi fare type. When you book a Lite or Standard fare type, there is an additional fee for this seat. This seat may have restricted legroom due to the position of the bulkhead. The tray table is in the armrest, making the armrest immovable, and slightly reducing seat width. There is no floor storage for this seat during takeoff and landing. 41 H None No Power Seat 41 H is a standard Economy seat that Singapore Air designates as a "Forward Zone Seat". Forward Zone Seats enable you to be among the first in Economy Class to disembark the plane. You may select these seats in advance for free when you book a Flexi fare type. When you book a Lite or Standard fare type, there is an additional fee for this seat. This seat may have restricted legroom due to the position of the bulkhead. The tray table is in the armrest, making the armrest immovable, and slightly reducing seat width. There is no floor storage for this seat during takeoff and landing. 41 J None No Power Seat 41 J is a standard Economy seat that Singapore Air designates as a "Forward Zone Seat". Forward Zone Seats enable you to be among the first in Economy Class to disembark the plane. You may select these seats in advance for free when you book a Flexi fare type. When you book a Lite or Standard fare type, there is an additional fee for this seat. This seat may have restricted legroom due to the position of the bulkhead. The tray table is in the armrest, making the armrest immovable, and slightly reducing seat width. There is no floor storage for this seat during takeoff and landing. 41 K None No Power Seat 41 K is a standard Economy seat that Singapore Air designates as a "Forward Zone Seat". Forward Zone Seats enable you to be among the first in Economy Class to disembark the plane. You may select these seats in advance for free when you book a Flexi fare type. When you book a Lite or Standard fare type, there is an additional fee for this seat. This seat may have restricted legroom due to the position of the bulkhead. The tray table is in the armrest, making the armrest immovable, and slightly reducing seat width. There is no floor storage for this seat during takeoff and landing. 42 F None No Power Seat 42 F is a standard Economy seat that Singapore Air designates as a "Forward Zone Seat". Forward Zone Seats enable you to be among the first in Economy Class to disembark the plane. You may select these seats in advance for free when you book a Flexi fare type. When you book a Lite or Standard fare type, there is an additional fee for this seat. 43 F None No Power Seat 43 F is a standard Economy seat that Singapore Air designates as a "Forward Zone Seat". Forward Zone Seats enable you to be among the first in Economy Class to disembark the plane. You may select these seats in advance for free when you book a Flexi fare type. When you book a Lite or Standard fare type, there is an additional fee for this seat. 44 F None No Power Seat 44 F is a standard Economy seat that Singapore Air designates as a "Forward Zone Seat". Forward Zone Seats enable you to be among the first in Economy Class to disembark the plane. You may select these seats in advance for free when you book a Flexi fare type. When you book a Lite or Standard fare type, there is an additional fee for this seat. 45 F None No Power Seat 45 F is a standard Economy seat that Singapore Air designates as a "Forward Zone Seat". Forward Zone Seats enable you to be among the first in Economy Class to disembark the plane. You may select these seats in advance for free when you book a Flexi fare type. When you book a Lite or Standard fare type, there is an additional fee for this seat. 46 A None No Power Seat 46 A is a standard Economy seat that Singapore Air designates as a "Forward Zone Seat". Forward Zone Seats enable you to be among the first in Economy Class to disembark the plane. You may select these seats in advance for free when you book a Flexi fare type. When you book a Lite or Standard fare type, there is an additional fee for this seat. The proximity to the lavatories may be bothersome. 46 B None No Power Seat 46 B is a standard Economy seat that Singapore Air designates as a "Forward Zone Seat". Forward Zone Seats enable you to be among the first in Economy Class to disembark the plane. You may select these seats in advance for free when you book a Flexi fare type. When you book a Lite or Standard fare type, there is an additional fee for this seat. The proximity to the lavatories may be bothersome. 46 C None No Power Seat 46 C is a standard Economy seat that Singapore Air designates as a "Forward Zone Seat". Forward Zone Seats enable you to be among the first in Economy Class to disembark the plane. You may select these seats in advance for free when you book a Flexi fare type. When you book a Lite or Standard fare type, there is an additional fee for this seat. The proximity to the lavatories may be bothersome. 46 D None No Power Seat 46 D is a standard Economy seat that Singapore Air designates as a "Forward Zone Seat". Forward Zone Seats enable you to be among the first in Economy Class to disembark the plane. You may select these seats in advance for free when you book a Flexi fare type. When you book a Lite or Standard fare type, there is an additional fee for this seat. The proximity to the lavatories may be bothersome. 46 E None No Power Seat 46 E is a standard Economy seat that Singapore Air designates as a "Forward Zone Seat". Forward Zone Seats enable you to be among the first in Economy Class to disembark the plane. You may select these seats in advance for free when you book a Flexi fare type. When you book a Lite or Standard fare type, there is an additional fee for this seat. The proximity to the lavatories may be bothersome. 46 F None No Power Seat 46 F is a standard Economy seat that Singapore Air designates as a "Forward Zone Seat". Forward Zone Seats enable you to be among the first in Economy Class to disembark the plane. You may select these seats in advance for free when you book a Flexi fare type. When you book a Lite or Standard fare type, there is an additional fee for this seat. The proximity to the lavatories may be bothersome. 46 G None No Power Seat 46 G is a standard Economy seat that Singapore Air designates as a "Forward Zone Seat". Forward Zone Seats enable you to be among the first in Economy Class to disembark the plane. You may select these seats in advance for free when you book a Flexi fare type. When you book a Lite or Standard fare type, there is an additional fee for this seat. The proximity to the lavatories may be bothersome. 46 H None No Power Seat 46 H is a standard Economy seat that Singapore Air designates as a "Forward Zone Seat". Forward Zone Seats enable you to be among the first in Economy Class to disembark the plane. You may select these seats in advance for free when you book a Flexi fare type. When you book a Lite or Standard fare type, there is an additional fee for this seat. The proximity to the lavatories may be bothersome. 46 J None No Power Seat 46 J is a standard Economy seat that Singapore Air designates as a "Forward Zone Seat". Forward Zone Seats enable you to be among the first in Economy Class to disembark the plane. You may select these seats in advance for free when you book a Flexi fare type. When you book a Lite or Standard fare type, there is an additional fee for this seat. The proximity to the lavatories may be bothersome. 46 K None No Power Seat 46 K is a standard Economy seat that Singapore Air designates as a "Forward Zone Seat". Forward Zone Seats enable you to be among the first in Economy Class to disembark the plane. You may select these seats in advance for free when you book a Flexi fare type. When you book a Lite or Standard fare type, there is an additional fee for this seat. The proximity to the lavatories may be bothersome. 47 A None No Power Seat 47 A is an Economy Class seat that has extra legroom due to the exit however, the close proximity to the lavatories may be bothersome. The tray table is in the armrest, making the armrest immovable and slightly reducing seat width. There is no floor storage during take-off or landing. This seat is missing a window. 47 B None No Power Seat 47 B is an Economy Class seat that has extra legroom due to the exit however, the close proximity to the lavatories may be bothersome. The tray table is in the armrest, making the armrest immovable and slightly reducing seat width. There is no floor storage during take-off or landing. 47 C None No Power Seat 47 C is an Economy Class seat that has extra legroom due to the exit however, the close proximity to the lavatories may be bothersome. The tray table is in the armrest, making the armrest immovable and slightly reducing seat width. There is no floor storage during take-off or landing. 47 H None No Power Seat 47 H is an Economy Class seat that has extra legroom due to the exit however, the close proximity to the lavatories may be bothersome. The tray table is in the armrest, making the armrest immovable and slightly reducing seat width. There is no floor storage during take-off or landing. 47 J None No Power Seat 47 J is an Economy Class seat that has extra legroom due to the exit however, the close proximity to the lavatories may be bothersome. The tray table is in the armrest, making the armrest immovable and slightly reducing seat width. There is no floor storage during take-off or landing. 47 K None No Power Seat 47 K is an Economy Class seat that has extra legroom due to the exit however, the close proximity to the lavatories may be bothersome. The tray table is in the armrest, making the armrest immovable and slightly reducing seat width. There is no floor storage during take-off or landing. This seat is missing a window. 48 D None No Power Seat 48 D is a standard Economy Class seat that may have restricted legroom due to the position of the bulkhead. The proximity to the lavatories may be bothersome. There is no floor storage for this seat during takeoff and landing. 48 E None No Power Seat 48 E is a standard Economy Class seat that may have restricted legroom due to the position of the bulkhead. The proximity to the lavatories may be bothersome. There is no floor storage for this seat during takeoff and landing. 48 F None No Power Seat 48 F is a standard Economy Class seat that may have restricted legroom due to the position of the bulkhead. The proximity to the lavatories may be bothersome. There is no floor storage for this seat during takeoff and landing. 48 G None No Power Seat 48 G is a standard Economy Class seat that may have restricted legroom due to the position of the bulkhead. The proximity to the lavatories may be bothersome. There is no floor storage for this seat during takeoff and landing. 49 D None No Power Seat 49 D is a standard Economy Class seat however, other flyers tend to bump into this seat. 51 D None No Power Seat 51 D is a standard Economy Class seat that has extra legroom due to the missing seat in front. 55 D None No Power Seat 55 D is a standard Economy Class seat however, the proximity to the galleys may be bothersome. 55 E None No Power Seat 55 E is a standard Economy Class seat however, the proximity to the galleys may be bothersome. 55 F None No Power Seat 55 F is a standard Economy Class seat however, the proximity to the galleys may be bothersome. 55 G None No Power Seat 55 G is a standard Economy Class seat however, the proximity to the galleys may be bothersome. 56 A None No Power Seat 56 A is a standard Economy Class seat however, the proximity to the galleys may be bothersome. 56 B None No Power Seat 56 B is a standard Economy Class seat however, the proximity to the galleys may be bothersome. 56 C None No Power Seat 56 C is a standard Economy Class seat however, the proximity to the galleys may be bothersome. 56 H None No Power Seat 56 H is a standard Economy Class seat however, the proximity to the galleys may be bothersome. 56 J None No Power Seat 56 J is a standard Economy Class seat however, the proximity to the galleys may be bothersome. 56 K None No Power Seat 56 K is a standard Economy Class seat however, the proximity to the galleys may be bothersome. 57 A None No Power Seat 57 A is an Economy Class seat that may have extra legroom due to the exit however, the close proximity to the galleys may be bothersome. The tray table is in the armrest, making the armrest immovable and slightly reducing seat width. There is no floor storage during take-off or landing. This seat is missing a window. 57 B None No Power Seat 57 B is an Economy Class seat that has extra legroom due to the exit however, the close proximity to the galleys may be bothersome. The tray table is in the armrest, making the armrest immovable and slightly reducing seat width. There is no floor storage during take-off or landing. 57 C None No Power Seat 57 C is an Economy Class seat that has extra legroom due to the exit however, the close proximity to the galleys may be bothersome. The tray table is in the armrest, making the armrest immovable and slightly reducing seat width. There is no floor storage during take-off or landing. 57 D None No Power Seat 57 D is a standard Economy Class seat that may have restricted legroom due to the position of the bulkhead. The proximity to the galleys may be bothersome. There is no floor storage for this seat during takeoff and landing. 57 E None No Power Seat 57 E is a standard Economy Class seat that may have restricted legroom due to the position of the bulkhead. The proximity to the galleys may be bothersome. There is no floor storage for this seat during takeoff and landing. 57 F None No Power Seat 57 F is a standard Economy Class seat that may have restricted legroom due to the position of the bulkhead. The proximity to the galleys may be bothersome. There is no floor storage for this seat during takeoff and landing. 57 G None No Power Seat 57 G is a standard Economy Class seat that may have restricted legroom due to the position of the bulkhead. The proximity to the galleys may be bothersome. There is no floor storage for this seat during takeoff and landing. 57 H None No Power Seat 57 H is an Economy Class seat that has extra legroom due to the exit however, the close proximity to the galleys may be bothersome. The tray table is in the armrest, making the armrest immovable and slightly reducing seat width. There is no floor storage during take-off or landing. 57 J None No Power Seat 57 J is an Economy Class seat that has extra legroom due to the exit however, the close proximity to the galleys may be bothersome. The tray table is in the armrest, making the armrest immovable and slightly reducing seat width. There is no floor storage during take-off or landing. 57 K None No Power Seat 57 K is an Economy Class seat that may have extra legroom due to the exit however, the close proximity to the galleys may be bothersome. The tray table is in the armrest, making the armrest immovable and slightly reducing seat width. There is no floor storage during take-off or landing. This seat is missing a window. 65 A None No Power Seat 65 A is a standard Economy Class seat in the last row of the aircraft and is missing a window. This seat may have slightly limited recline and the proximity to the lavatories may be bothersome. 65 B None No Power Seat 65 B is a standard Economy Class seat in the last row of the aircraft. This seat may have slightly limited recline and the proximity to the lavatories may be bothersome. 65 C None No Power Seat 65 C is a standard Economy Class seat in the last row of the aircraft. This seat may have slightly limited recline and the proximity to the lavatories may be bothersome. 65 H None No Power Seat 65 H is a standard Economy Class seat in the last row of the aircraft. This seat may have slightly limited recline and the proximity to the lavatories may be bothersome. 65 J None No Power Seat 65 J is a standard Economy Class seat in the last row of the aircraft. This seat may have slightly limited recline and the proximity to the lavatories may be bothersome. 65 K None No Power Seat 65 K is a standard Economy Class seat in the last row of the aircraft and is missing a window. This seat may have slightly limited recline and the proximity to the lavatories may be bothersome. 66 D None No Power Seat 66 D is a standard Economy Class seat in the last row of the aircraft. This seat may have slightly limited recline and the proximity to the lavatories may be bothersome. 66 E None No Power Seat 66 E is a standard Economy Class seat in the last row of the aircraft. This seat may have slightly limited recline and the proximity to the lavatories may be bothersome. 66 F None No Power Seat 66 F is a standard Economy Class seat in the last row of the aircraft. This seat may have slightly limited recline and the proximity to the lavatories may be bothersome. 66 G None No Power Seat 66 G is a standard Economy Class seat in the last row of the aircraft. This seat may have slightly limited recline and the proximity to the lavatories may be bothersome. 71 A None No Power Seat 71 A is an Economy Class seat that has extra legroom due to the exit however, the close proximity to the lavatories may be bothersome. The tray table is in the armrest, making the armrest immovable and slightly reducing seat width. There is no floor storage during take-off or landing. This seat is missing a window. 71 C None No Power Seat 71 C is an Economy Class seat that has extra legroom due to the exit however, the close proximity to the lavatories may be bothersome. The tray table is in the armrest, making the armrest immovable and slightly reducing seat width. There is no floor storage during take-off or landing. 71 H None No Power Seat 71 H is an Economy Class Exit Row seat with extra legroom. The close proximity to the lavatories may be bothersome. The tray table is in the armrest, making the armrest immovable and slightly reducing seat width. There is no floor storage during take-off or landing. 71 K None No Power Seat 71 K is an Economy Class seat that has extra legroom due to the exit however, the close proximity to the lavatories may be bothersome. The tray table is in the armrest, making the armrest immovable and slightly reducing seat width. There is no floor storage during take-off or landing. This seat is missing a window. 72 D None No Power Seat 72 D is a standard Economy Class seat that may have restricted legroom due to the position of the bulkhead. The proximity to the lavatories may be bothersome. There is no floor storage for this seat during takeoff and landing. 72 E None No Power Seat 72 E is a standard Economy Class seat that may have restricted legroom due to the position of the bulkhead. The proximity to the lavatories may be bothersome. There is no floor storage for this seat during takeoff and landing. 72 F None No Power Seat 72 F is a standard Economy Class seat that may have restricted legroom due to the position of the bulkhead. The proximity to the lavatories may be bothersome. There is no floor storage for this seat during takeoff and landing. 72 G None No Power Seat 72 G is a standard Economy Class seat that may have restricted legroom due to the position of the bulkhead. The proximity to the lavatories may be bothersome. There is no floor storage for this seat during takeoff and landing. 73 C None No Power Seat 73 C is a standard Economy Class seat. 73 H None No Power Seat 73 H is a standard Economy Class seat. 74 C None No Power Seat 74 C is a standard Economy Class seat. 74 H None No Power Seat 74 H is a standard Economy Class seat. 75 C None No Power Seat 75 C is a standard Economy Class seat. 75 H None No Power Seat 75 H is a standard Economy Class seat. 76 C None No Power Seat 76 C is a standard Economy Class seat. 76 H None No Power Seat 76 H is a standard Economy Class seat. 77 C None No Power Seat 77 C is a standard Economy Class seat. 77 H None No Power Seat 77 H is a standard Economy Class seat. 78 A None No Power Seat 78 A is a standard Economy Class seat. 78 C None No Power Seat 78 C is a standard Economy Class seat. 78 H None No Power Seat 78 H is a standard Economy Class seat. 78 K None No Power Seat 78 K is a standard Economy Class seat. 79 A None No Power Seat 79 A is a standard Economy Class seat that may have limited recline due to the exit row behind. 79 C None No Power Seat 79 C is a standard Economy Class seat that may have limited recline due to the exit row behind. 79 D None No Power Seat 79 D is a standard Economy Class seat that may have limited recline due to the exit row behind. 79 E None No Power Seat 79 E is a standard Economy Class seat that may have limited recline due to the exit row behind. 79 F None No Power Seat 79 F is a standard Economy Class seat that may have limited recline due to the exit row behind. 79 G None No Power Seat 79 G is a standard Economy Class seat that may have limited recline due to the exit row behind. 79 H None No Power Seat 79 H is a standard Economy Class seat that may have limited recline due to the exit row behind. 79 K None No Power Seat 79 K is a standard Economy Class seat that may have limited recline due to the exit row behind. 80 D None No Power Seat 80 D is an Economy Class seat that has extra legroom due to the exit. The tray table is in the armrest, making the armrest immovable and slightly reducing seat width. There is no floor storage during take-off or landing. 80 E None No Power Seat 80 E is an Economy Class seat that has extra legroom due to the exit. The tray table is in the armrest, making the armrest immovable and slightly reducing seat width. There is no floor storage during take-off or landing. 80 F None No Power Seat 80 F is an Economy Class seat that has extra legroom due to the exit. The tray table is in the armrest, making the armrest immovable and slightly reducing seat width. There is no floor storage during take-off or landing. 80 G None No Power Seat 80 G is an Economy Class seat that has extra legroom due to the exit. The tray table is in the armrest, making the armrest immovable and slightly reducing seat width. There is no floor storage during take-off or landing. 81 A None No Power Seat 81 A is an Economy Class seat that has extra legroom due to the exit however, this seat is missing a window. The tray table is in the armrest, making the armrest immovable and slightly reducing seat width. There is no floor storage during take-off or landing. 81 C None No Power Seat 81 C is an Economy Class seat that has extra legroom due to the exit. The tray table is in the armrest, making the armrest immovable and slightly reducing seat width. There is no floor storage during take-off or landing. 81 D None No Power Seat 81 D is a standard Economy Class seat however, other flyers tend to bump into this seat. The proximity to the lavatory may be bothersome. 81 G None No Power Seat 81 G is a standard Economy Class seat that may get bumped due to the change in configuration from 4 to 2 seats in the row behind. 81 H None No Power Seat 81 H is an Economy Class seat that has extra legroom due to the exit. The tray table is in the armrest, making the armrest immovable and slightly reducing seat width. There is no floor storage during take-off or landing. 81 K None No Power Seat 81 K is an Economy Class Exit Row seat that does not have a window. The tray table is in the armrest, making the armrest immovable and slightly reducing seat width. There is no floor storage during take-off or landing. 82 A None No Power Seat 82 A is a standard Economy Class seat in the last row of the aircraft. This seat may have slightly limited recline and the proximity to the lavatories may be bothersome. 82 C None No Power Seat 82 C is a standard Economy Class seat in the last row of the aircraft. This seat may have slightly limited recline and the proximity to the lavatories may be bothersome. 82 D None No Power Seat 82 D is a standard Economy Class seat however, the proximity to the lavatories may be bothersome. 82 G None No Power Seat 82 G is a standard Economy Class seat however, the proximity to the lavatories may be bothersome. 82 H None No Power Seat 82 H is a standard Economy Class seat in the last row of the aircraft. This seat may have slightly limited recline and the proximity to the lavatories may be bothersome. 82 K None No Power Seat 82 K is a standard Economy Class seat in the last row of the aircraft. This seat may have slightly limited recline and the proximity to the lavatories may be bothersome. 83 D None No Power Seat 83 D is a standard Economy Class seat in the last row of the aircraft. This seat may have slightly limited recline and the proximity to the lavatories may be bothersome. 83 G None No Power Seat 83 G is a standard Economy Class seat in the last row of the aircraft. This seat may have slightly limited recline and the proximity to the lavatories may be bothersome. Singapore Airlines' upgraded KrisWorld entertainment system offers 100 movies and 180 television programs OnDemand, as well as games and other entertainment options. Each suite has a 23.0" flat screen and comes equipped with Bose headphones. Each business class seat is outfitted with a 15.4" LCD monitor, and economy seats each have their own 10.6" personal TVs. 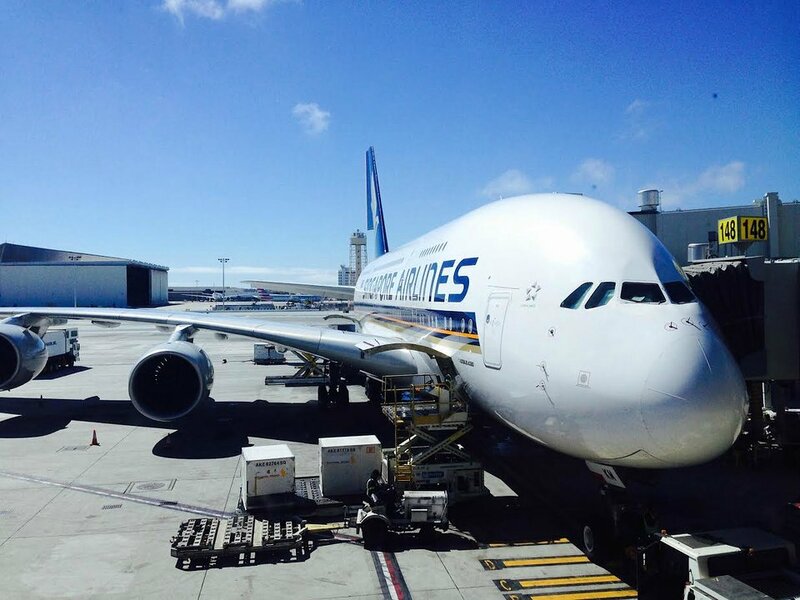 This A380-800 features a four class configuration with 12 First Class closed suites, 60 flat bed Business Class seats, 36 Premium Economy seats, and 333 standard Economy Class seats. Although it is near lavatory, this seat as well as all seats of this row have leg space over the whole width of the seat - not as the other rows where you can putyour legs only in half of the width. The seats of row 27 offer an excellent comfort for sleeping and giving impression to be in a first class suite. Moreover you have more privacy as the separating wall in front of you is higher than to other rows in front. Although it is near lavatory, this seat as well as all seats of this row have leg space over the whole width of the seat - not as the other rows where you can putyour legs only in half of the width. The seats of row 17 offer an excellent comfort for sleeping and giving impression to be in a first class suite. The seat looks big, but is not convenient. There is only a tiny hole to put your feet, s you are not seat straight. Worst is when you want to sleep. The seat is folded and then the tiny hole from the guy behind is in your bed on the same side, which means your body is on the left and your feet on the right. You are not straight and this is not comfortable at all. All SG business have this configuration. They just look good. PE in Singapore Airlines is in my opinion a very good choice. All you have to do is to use the excellent features like order your meal by "book the cook" in advance. Crew is taking very much care. Food comes with a extra white table cloth. If you pay an extra fee for a P seat like I've got, then you feel nearly like Business Class as your luggage is handled priority. By the way, hot towel is provided in all classes in Singapore Airlines. This was my first experience of PE on Singapore Airlines. The seats are comfy and well-designed, with a single-leaf tray table that is easy to stow and deploy. The footrest on the seat combines with the legrest on the seat in front to make a very adequate leg support. However, the inflight service is basically Economy with a few added extras like hot towels, and does not compare to the level of service on Air NZ, for example. Will try to avoid Singapore PE in the future, as not really worth the extra. Seat 14K was a great seat! Being near the toilet is not a problem for me .Recline was normal and nice to not have to worry about pax behind.The foot rests are annoying and in the way. The seat was comfortable but it was very cold at the back. Needed two blankets to keep warm. This seat was comfortable in terms of good legroom, and being on the aisle it was easy to get up to access the locker and restrooms. It was close to the galley and the stewardesses were lovely, inviting me to go to the galley anytime to get snacks or drinks. This was the first row in economy and near the front of the plane, so served early with meals and easy to get off quickly on arrival. It is against a bulkhead wall so my neighbour had to ask me to get up if she needed to go out. The restrooms weren't far away. I was seated with a couple that had a baby in the bassinet but it was not an issue. They managed their baby really well throughout the long night flight from Zurich to Singapore - it hardly cried at all. Across the aisle to my left was another couple with a baby and I noticed that their window seat passenger was blocked into his seat by the bassinet. He had to ask them both to get up if he needed out to use the restroom. I would not recommend seats 41 A or K for that reason. The seat on row 65A have no windows. Sat in this seat for a recent flight to Singapore from LHR. Plenty of room on the top deck despite the 13hr flight. We were well looked after by the Singapore Airlines staff, service very prompt and efficient, magnificent aircraft by the way. I flew from SIN to SYD on 18th May. I am 184cm tall and found this seat to be most satisfactory. This seat and those adjacent suffer from the nearby business class toilets when they are flushed - the noise is very audible. The service from Singapre attendants was great. The seat is very comfortable and spacious. Good selection of food (use the "book a cook" previous the flight and you get a great meal. Beverage selection is good. After take off you get even a glass or two or three of champagne. Entertainment could be better. In particular I'm missing classic movies. Crew is very helpful and even good for a small talk. The PE seat is good, but the is an issue with the galley curtain. On a long flight LHR - SIN (2 May) when you are trying to sleep. Your legs are constantly getting wacked with the curtain as the crew run in and out of the galley, very poor design, and could be fixed by simply possitioning it squarely with the bulkhead, instead of at 45 deg they are currently. The food wash less than apertising. Very poor for an airline which was once a leader. I traveled on 3 A380 aircraft and found the Business Class seats very uncomfortable for a tall person. When in normal upright position,I found it difficult to get comfortable as the seat does not recline fully and there is nowhere to put you legs except in a small compartment at the front left side of the seat. I found it very uncomfortable to sleep because of the limited leg space. In the end, I sat up all night. Food very ordinary, especially breakfast, with only 6 pieces of fruit and a bread roll. Virgin Australia and Etihad have much better business class seats. superb fresh clean aircraft with wonderful service . limited leg room great air. Water is not individual bottles. Food was tasteless and bland stodgy. Movies were dull. but the air craft was very clean thank you. These seats (17A/K) are probably the worst business class seats on this plane. It's super busy and loud around the galley. Seats should be RED! Very cramped, but nice quiet noise of the a380. I recommend you fly on cathay pacific or another airline. Because this was super cramped and the headphones they gave you were bad quality and didn't stay in your ear. The first point I wish to make is that the Premium Economy seating location & configuration is painfully obviously a retro_fit disaster. OK, the seats are quite comfy but that is where the value for the extra fare ends. We were not even offered a cool drink on boarding. The meal & drinks service is exactly the same as the economy section just behind the bulkheads. I can confirm this because the cabin crew just wheeled on by after serving PE pax.The 3 wines offered were very pedestrian & not up to an increased class standard.Would never pay the huge extra amount again on SQ. Pity QF dosn't have PE on the A330 to Singapore because you can tell that the SQ version is trying to play catch up & not very successfully. There's a high chance people will tread on your feet as they pass through the curtain, as the walkway from the area in front is directly in front of this seat. I had seat 51D on the way back from Paris last week and found it was great. I am tall so was happy to pay the extra for the seat. Apparently the missing seat in front of 51D is because there is an emergency escape hatch under the carpet for the crew sleeping quarters which are immediately below. I would make sure I got that seat again next time. On the way over to Paris there was a change of aircraft and Seat 51D had a seat in front of it so I ended up in seat 47H and it was nowhere near as good. We were disappointed with these seats after the 777-300ER. The leg room was not as good with the foot stands interfering with being able to stretch out under the seat in front whether they were up or down. The screens were also smaller and the range of entertainment was less. Disappointing given this was a long tiring flight from Singapore to London. Also my daughter's entertainment system stopped working and couldn't be fixed. There is no storage box between seat and window (as there is with other upper deck window seats). Occupied by IFE box. Huge wide leather chair and ample footroom before you even reach the ottoman seat designed for use by a companion. This suite had 2 windows; some have 3. The bed pulls down from the back wall to create a proper bed that is wider than the seat convertion system used by other airlines and as it has a full mattress it allows proper sleep. Crew very attentive; food excellent; washroom alrge enough and spotless. Lots of cubby holes. Good 'track suit' provided. Aircraft fairly quite at this position. Sing/Syd. Excellent seats & much better than bulkhead or 777 PE. Lots of space between rows made access easy for window. I could fully stretch my legs & use drop down foot rest. Good screen & storage for personal use. Pleased I paid extra for PE when I looked at normal economy. I don't understand why seat 81A and 81K is marked in red. Yes it doesn't has a window, nor the storage bin one can find on all the other windows seat on the upper deck economy. And yes there are no under seat storage during take off/landing. But you do get a mile long legroom as a result. So might as well stuff everything in the checked in luggage (given Singapore Airlines already have a pretty generous 30kg checked in luggage) and stretch out. Oh yes the tray table and tv is in the armrest making the seats slightly narrower, but the Economy seat on Singapore Airlines are pretty wide anyway so it is still wider than a vast majority of European/American airlines economy seat! I had a return flight on seat 71K and the same comment apply. Even greater was it was the first row in this economy cabin so there are no one to disturb you and you are usually the first to be served. The proximity to the lavatories wasn't bothersome at all as those were for business class passengers. As a general comment through the upper deck economy is at the back of the plane and therefore it gets extra choppy during turbulence. 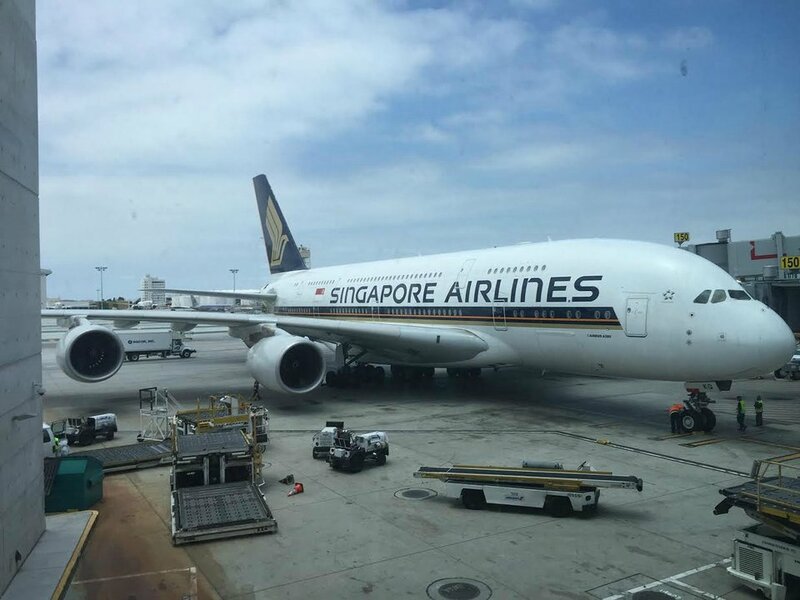 Singapore Airlines flies 3 versions of Airbus A380-800.